(Painting by Rabbi Berel Wein). Boker tov, Boulder! has a remarkable post reminding us that this evening is not only New Year’s Eve, but also the end of the Tenth of Tevet, a day of fasting until sundown, on which the Kaddish is said for people whose date or place of death is unknown. 'Therefore, each person is obligated to examine his deeds and to repent during these days. As it is written of the people of Nineveh: 'And the Lord saw their actions' (Yonah 3), upon which the Rabbis say: 'It is not said, He saw their sackcloth and fasting, but rather their actions ' (Ta'anit 22). Before the celebration this evening, a beautiful moment of reflection and resolve here. May we only have days of goodness in our future to commemorate, and may we make our own contribution toward achieving them in 2007.
what they did for me deserves eternal peace. (a world away) to the evening fog of West Virginia. this child across the rising dark water. . . Wait, don’t make her yet. I need to ask you this. than trees, more fish than sea. not me, but a picture of me. The rest of the poems are here. 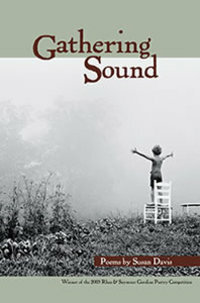 A beautiful book, full of lines of grace and love, by the Winner of the 2005 Rhea & Seymour Gorsline Poetry Competition. (Hat tip, and thank you, to Alan Croll). How Fast Can You Run in 10 Seconds? Another teenage boy was crying, speaking on his cell-phone, shivering as he explained to his mother what he’d just been through, and then he was evacuated with his friend standing next to him to another ambulance. They were both treated for shock. . . . This 57th missile attack landed on ‘Macabees ‘ Street in Sderot, which landed only 10 seconds after the siren. A friend of the boys who was hit by the missile related that they were running home, but didn’t make it there. People in Sderot have to think twice before they go out somewhere, not knowing if they will be able to take cover in 15 seconds or less, some times with no siren -- like the day before, when the residents of Sderot were woken up from at 6:30 am, by missile attack with no siren going off. They did not know what to do first to express their outrage. They discussed wanting to go burn tires, or block roads, not sure what to do, but to do some thing. They kept repeating that there had been an average of two missile attacks a day during this so-called ‘cease fire’ with no response what so ever. . . .
All this occurred on ‘Maccabee’ Road in Sderot, less than one week after the celebration of Hannukah, when Jews recite ‘Al H’nisim’, the prayer for miracles. Unfortunately, it’s not Hanukkah every day, even though there are miracles that happen here every single day. These miracles should happen only when Jews take an action -- as in the case of the Maccabees. People in Sderot depend on miracles, with a feeling of hopelessness. Not able to protect their own family, they are separated from Israel and the world, where no one is taking action about the fact that Jewish blood is being spilled, and with no government seemingly ready to protect them. . . .
How did Israel get to the situation where mothers are scared and hopeless for the protection of their own children, when people are scared to go out of there homes, out to the playground, to school? . . .
What most people in Israel do not understand is that we all live on Maccabees Street. 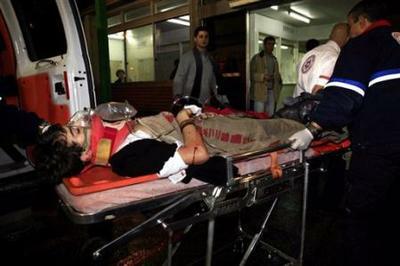 Israeli medics wheel a teenage boy, wounded by a homemade rocket fired by Palestinian militants in the town of Sderot, into hospital in the port city of Ashkelon, Tuesday, Dec, 26 2006. Alvin H. Rosenfeld, professor of English and Jewish Studies and director of the Institute for Jewish Culture and the Arts at Indiana University, has published “‘Progressive’ Jewish Thought and the New Anti-Semitism” (American Jewish Committee December 2006). It is essential reading. Rosenfeld is the author of "Imagining Hitler" and "A Double Dying: Reflections on Holocaust Literature," among other books, and is knowledgeable on Holocaust literature, Jewish writers in America, Jewish autobiography, the Adolph Hitler mystique, anti-Semitism, and Anne Frank. His new monograph is an important document. We must be staunch in our conviction that freedom is not the sole prerogative of a lucky few, but the inalienable and universal right of all human beings. . . . The objective I propose is quite simple to state: to foster the infrastructure of democracy . . . which allows a people to choose their own way to develop their own culture, to reconcile their own differences through peaceful means. This is not cultural imperialism, it is providing the means for genuine self-determination and protection for diversity. Democracy already flourishes in countries with very different cultures and historical experiences. It would be cultural condescension, or worse, to say that any people prefer dictatorship to democracy. There is a reason why the Christian tradition distinguishes between hope, which is considered a theological virtue, and optimism, which is not. Conservatism will be like the salt that has lost its savor if it abandons its mission to remind us of what Thomas Sowell has called “the constrained vision” of human existence -- the vision that sees life as a struggle full of unintended consequences and tragic dilemmas, involving people whose noblest efforts often fail, sometimes miserably so. As Abraham Lincoln reminded us in his own second inaugural address, the hand of Providence may be present in our reversals as well as in our triumphs. Hope can survive such reversals, even when optimism cannot. It strikes me that this remains a useful and important lesson, especially for a nation with, at the moment, so many charges to keep. “A Charge to Keep” is the title of the campaign autobiography of the 43rd president of the United States, whose own Second Inaugural Address echoed Lincoln’s. When Mr. Bush met privately last week with a dozen rabbis and Jewish educators, they expected he might open the conversation by talking about Israel. Instead, the president greeted them in the Roosevelt Room of the White House with a discourse on Iraq, and why he still believes it can be a beacon for democracy in the Middle East. 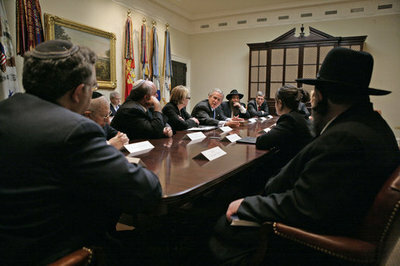 “I got the sense of a man who feels very heavily the weight of history,” said Robert Wexler, president of the University of Judaism in Los Angeles, who attended the meeting . . . .
President George W. Bush meets with Jewish leaders from the higher education community in the Roosevelt Room Monday, Dec. 18, 2006. (White House photo by Eric Draper). I don't recognize Carter any more. . . . He has not just turned his back on the balance and fairness that all peacemaking depends on. He has become a spokesman for the enemies of my people. He has become an apologist for terrorists. . . . I have read with shock and sadness Carter's biased, harmful book "Palestine: Peace not Apartheid." I have watched as Carter was interviewed in the media. He told CNN's Larry King that President Bill Clinton and envoy Dennis Ross were misrepresenting their peace efforts in 2000, insisting that only he knew the truth, even though they were there and he was not. . . . He has not once answered the many specific criticisms except to say, again and again, that his book is completely accurate. . . .
Carter has changed. Something has happened to his judgment. I don't understand what it is, but I know it is very dangerous. At a minimum, his legacy is irrevocably tarnished, and he will never again be a factor in the quest for Middle East peace. Those who think the Carter Center has been "thriving independently" in the past should read this. Boker tov, Boulder! 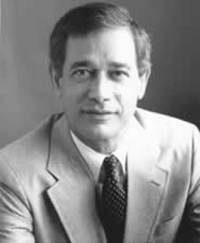 posts a letter from William Bradford Smith, another professor who has witnessed Carter up close, with some good comments about those who think that rebuttals to Carter are the same as “stifling” debate. The Carter Center has not responded to an email from JCI asking for the name of the “international correspondent” whom Carter alleges “fact-checked” his book, or to provide a citation to the name and page of the Atlas Carter asserts is the source of his doctored maps on page 148 of his book. We don’t think the Carter Center is ignoring us; we just don’t think there is any answer to the email they could give -- at least not one that would not further damage Carter’s sinking reputation even among those who previously admired him. UPDATE: Aramy964 has emailed me links to an article by Carol Gould (a documentary producer based in London) entitled “Jimmy Carter, American Revisionist" and a blog post entitled “The Guardian's Israel Boycott and Iranian Holocaust Denial,” both worth reviewing, and also Michael Oren's piece at Opinion Journal -- "Jimmy Carter's Religious Problem" -- which demonstrates how far out of the mainstream of American presidents Carter has placed himself. Presidential press conferences are no longer events at which reporters seek real information. Instead, they seek presidential admissions that the war is going poorly, should be stopped immediately, and was wrong from the beginning. 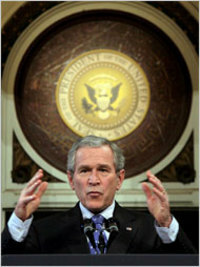 No, I haven't questioned whether or not it was right to take Saddam Hussein out, nor have I questioned the necessity for the American people -- I mean, I've questioned it; I've come to the conclusion it's the right decision. But I also know it's the right decision for America to stay engaged, and to take the lead, and to deal with these radicals and extremists, and to help support young democracies. It's the calling of our time, Sheryl. And I firmly believe it is necessary. And I believe the next President, whoever the person is, will have the same charge, the same obligations to deal with terrorists so they don't hurt us, and to help young democracies survive the threats of radicalism and extremism. It's in our nation's interest to do so. But the most painful aspect of the presidency is the fact that I know my decisions have caused young men and women to lose their lives. What to make of this mass depression over events on the ground [in Iraq]? Our supposed setback surely is not comparable to the destruction of the entire French army in less than eight weeks in 1940, the flight of the British from Dunkirk, followed in the next 24 months by the surrender of two British armies at Singapore and Tobruk, all of which led to consideration of a writ of censure of Winston Churchill. The military defeats and censure debate of 1942 are not widely remembered today, but Tobruk (in Libya) was a military disaster of staggering proportions. The British lost 50,000 men -- killed or captured -- in a single day. Not only had no one expected it; the British had in fact expected the opposite. Moreover, it was the culmination of a series of defeats in a war that, in its third year, was not going well -- disappointing those who had expected it to be over by 1942.
twenty-one hours of debate in which Mr. Churchill and most of his Ministers had been subjected to the most forthright and most outspoken criticism for being responsible through sins of omission or commission for a long series of defeats culminating in the most recent disaster in Libya. Facing his critics at last, the Prime Minister flatly refused to relinquish his job as Minister of Defense, defended his direction of Britain’s war effort and attributed the desert debacle to the fortunes and hazards of battle. . . .
Mr. Churchill made no effort to minimize the extent of the disaster suffered already by British arms in North Africa or the gravity of the Axis threat not only to Egypt but to the whole Middle East. He refrained from all predictions . . . [and] said he saw little reason for hoping the war would end this year, but, on the contrary, thought it would be a long war. He compared the disaster in the Middle East to the fall of France, but he vehemently denied it was due to faulty planning. . . . [H]e said the fall of Tobruk in a single day was as great a surprise to him and the generals and chiefs of staff as it was to the people. . . . In the past fortnight, he confessed with sadness, 50,000 men had been lost together with vast quantities of supplies which it takes four to six months to ship from here around the Cape of Good Hope to Egypt. Mr. Churchill was temperate and patient in his speech, which lasted ninety minutes, not even losing his temper when interrupted by Mr. Hore-Belisha, Sir John Warlaw-Milne, sponsor of the censure motion, and others who disagreed with his statements. But he made it clear that while he approved of freedom of expression in Parliament it was his opinion that those who had transformed what should have been a council of war into an attack upon the government were spreading dismay among the friends of Britain, giving aid and comfort to the enemy. Everything that can be thought of or raked up has been used to weaken confidence in the Government; has been used to prove the Ministers are incompetent and to weaken their confidence in themselves; to make the Army distrust the backing they are getting from the civil power . . . [t]o represent the Government as a set of nonentities over whom the Prime Minister towers and then to undermine him in his own heart and, if possible, before the eyes of the nation -- all this has poured out by cables and radio to all parts of the world and to the distress of all our friends and the delight of all our foes. . . .
Complaint has been made that the newspapers have been full of information of a very rosy character. Some members referred to that in the debate and that the government have declared themselves less fully informed than the newspapers. . . . [T]he government is in fact more accurately but less fully or colorfully informed than newspapers . . . I have never made any predictions except things like saying that Singapore would be held. What a fool and a knave I should have been to say it would fall. I have stuck hard to my blood, toil, tears and sweat – to which I have added muddles and mismanagements – and that I must admit is what, to some extent, we have got out of it. I will say nothing about the future, except to invite the House and nation to face with courage whatever it may unfold. If democracy and parliamentary institutions are to triumph in this war it is absolutely necessary that the governments resting upon them shall be able to act and dare, that the servants of the Crown and Parliament not be harassed by the nagging and snarling of disappointed men, that enemy propaganda shall not be fed needlessly out of our own hands, and that our reputation shall not be disparaged and undermined throughout the world . . . .
One wonders what Churchill would have thought about Bush’s accusers, or the spectacle of prominent senators trooping off to see Syria in the midst of the war, or a prior presidential candidate showing up in Egypt to criticize the president’s decision to wage it, or a prior president hawking a one-sided blast against a Middle East democracy under similar terror attacks -- and what his reaction would be if he learned they were all from the party of Franklin Delano Roosevelt. "Revisiting (and Reliving) 1938" -- the Movie, by David Zucker, is here. (Hat tip: K-Lo). Those still inclined to take James Baker’s report seriously after viewing Zucker’s video should review Ed Lasky’s remarkable reporting on those who wrote it. This weekend, Operation Gratitude shipped its 200,000th gift package to American troops serving in Iraq, Afghanistan and elsewhere, each package individually addressed to a specific soldier, with a personally-written letter accompanying each large boxful of items, individually packed by a volunteer. You have to look back three years to appreciate the magnitude of this milestone. 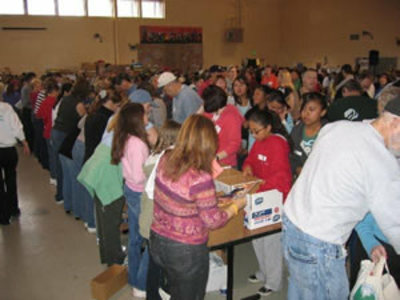 Operation Gratitude was formed in March 2003 by one person -- Carolyn Blashek -- a member of the Los Angeles congregation of Rabbi Mordechai Finley (Rabbi Finley’s son was serving in the Marines at the time). Working alone out of her living room, at her own expense, she began sending gift packages to the troops. By July of that year she had sent a remarkable 295 packages, and was profiled by the local press. 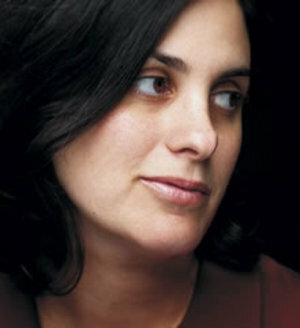 By July 2005, as friends and acquaintances and others heard or read of her efforts, as corporations began making contributions, as the Internet kicked in (with a significant boost from multiple prominent posts by Lucianne), and many more people joined her effort, commanders started sending her names of troops who needed mail, and within those two years the number of packages had risen to an incredible 63,984 packages, in a remarkable story of tikkun olam. In March of this year, George W. Bush invited Carolyn Blashek to the White House to thank her for her efforts, and she was invited back again this month. This past weekend, as Operation Gratitude shipped its 200,000 package on Saturday, it just kept on going, with a full day of packing yesterday. The effort resumes again on December 30-31, with new volunteers and contributions welcome here. These days another woman -- Karnit Goldwasser -- travels around the country, trying to call attention to three soldiers, held hostage along with their nation to unrelenting terror. On the Internet, Yael is trying to give Karnit’s efforts a significant boost, by illustrating where individuals could take this. The lesson from Operation Gratitude is that the efforts of a single individual can make a huge difference, and that women of valour can lead others to things that no one could imagine or predict. As with Operation Gratitude, the rest of us have an opportunity to help. 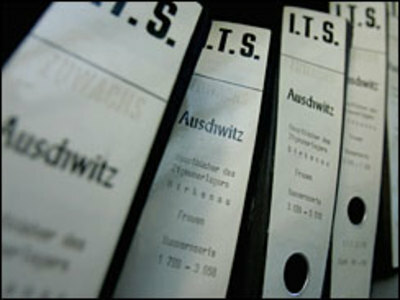 I wanted to give you a heads-up on a story that will be running this Sunday, Dec. 17 (7PM ET/PT on CBS) on "60 MINUTES" about a long-secret German archive that houses a treasure trove of information on 17.5 million victims of the Holocaust. The archive, located in the German town of Bad Arolsen, is massive (there are 16 miles of shelving containing 50 million pages of documents) and until recently, was off-limits to the public. But after the German government agreed earlier this year to open the archives, CBS News' Scott Pelley traveled there with three Jewish survivors who were able to see their own Holocaust records. It's an incredibly moving piece, all the more poignant in the wake of this week's meeting of Holocaust deniers in Iran. We're trying to get word out about the story to people who have a special interest in this subject. So we were hoping you'd consider sending out something to your listserve and/or posting something on your website. Further information will also be available on our website. Please feel free to contact me if you have any questions, and thanks for your consideration. (Forwarded by Rabbi David Wolpe).